A new facility close to the Stadium of Light in Sunderland providing employability skills. 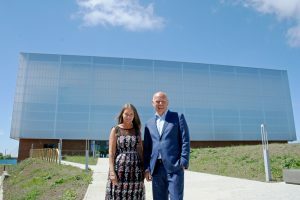 Beacon of Light is Sunderland’s most innovative sports and education facility and the first of its kind in the UK. The Beacon of Light (BoL) is a strategic regeneration and skills capital project delivering significant economic benefits for Sunderland and the North East LEP area. The facility features five stories of sports halls, football pitches, informal learning spaces and state-of-the-art education suites designed to facilitate four interactive zones — Education, Health and Wellbeing, Sport and Play, and World of Work. These areas have been carefully designed to deal with our region’s biggest challenges, and create life-changing opportunities for local people to re-energise our communities. The BoL is creating a pipeline of work-ready, skilled employees for smart specialisation and priority sectors, using the power of sport and football to engage people with no/low skills, enabling them to progress on a journey from first steps learning to Level 3 technical skills, alongside developing the employability skills required by businesses. Inclusive and easily accessible, Beacon of Light acts as a community hub for everyone who wants to take part in exciting programmes to improve their lives and prospects. Image caption: Andrew Hodgson, Chair, North East LEP with Chief Executive of the Foundation of Light, Lesley Spuhler.